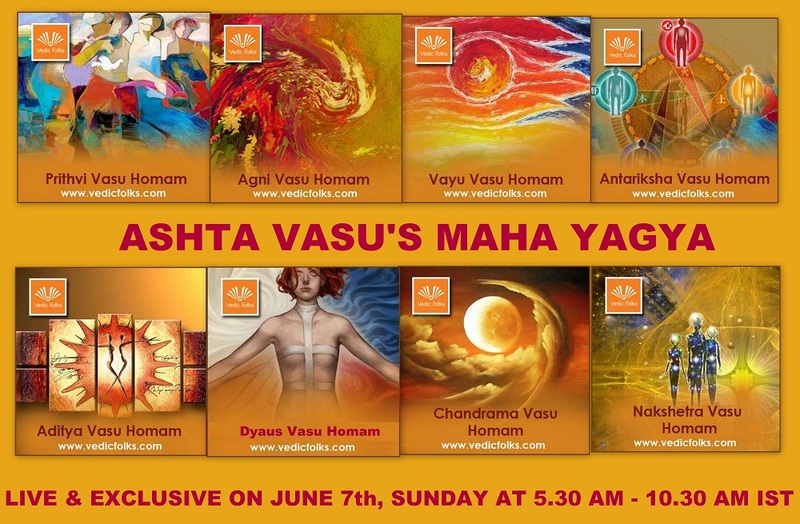 Ashta Vasu Maha Yagya is performed in the aim of inviting the eight vasus in agni.The Ashta Vasus eight elemental divinities /Gods they are signifing the characteristics of natural occurrence in the universe. We invite you all to contribute and participate in this special premium shared ritual of Ashta Vasus Maha Yagya for receiving blessings from eight aspects of natural gods. Prathana, Ganesha Puja, Doopam Deepam Neyvetyam, Karpoora Aarthi/Deeparathana, Mantra Pushpham for Ganesha, Sankalpa to Ejamanars/Sponsors, Yadhasthanam, Kalasa Avahanams, Archana for Avahana Devadas, Doopam Deepam Neyvetyam Deeparathana, Rudram, Chamakam, Purusa Suktham, Narayana Suktham, Durga Suktham, Sri Suktham, Bhakya Suktham, Shanthi Panchakam, Pavamana Suktham, Ayusha Suktham, Ashta Vasu Puja & Japa , Agni Invocation, Ganesha Homam, Parivara Devada Homam, Ashta Vasu Maha Yagya, Doopam Deepam Neyvetyam Deeparathana, Namaskaram, Maha Purna Huthi, Kalasa Deeparathana/Maha Deeparathana, Mantra Pushpam, Yadhasthanam, Kalasa Purochanam/Holy Water, Maha Prasadams, Final Namaskaram Process/Blessings from Bramanas. Prithvi vasu is considered to be a divine mother of earth and she is always seen along with deity Dyaus who is related with the sky. Preparing the sacred fire altar to receive the blessings of Goddess Prithvi-the God of Earth is referred to as Prithvi Vasu Homam. Prithvi represents the resourceful and the whole transformative energy / power of the universe. - Performing Prithvi Vasu Homam removes vasthu related doshas. - Helps to recover from bad effects which were caused by not constructing the house based on Vasthu Sastra. - Blessings of goddess prithvi help to stay safe in your own assets. Agni Vasu is the God of Fire. Whatever the give up made to Agni (Fire) is believed to be directly goes to the divinities because Agni is considered to be messengers to other deities. - Agni vasu homam transforms the evil to good and the restrained mercy to blessings. Vayu is the Lord of "Wind? and he is the controller of air. Lord Vayu is considered to be the protector of directions. - Lord Vayu Homam is sure to encircle your living space with utmost positive vibes and force that can re-enhance your life altogether to lead a happy and contended life. Aditya Vasu is the sun god, the giver of light. He not only the light-giver in a human?s life, but he also leads with major aspects such as leadership, king making, primary focus and such ruling things in life. - One should perform this homam for a brighter career, start-up business, a newly owned immovable asset and for your overall life?s improvement. Dyaus Vasu is the lord / Father of Sky and the husband of goddess Prithvi (Mother of Earth). Both of them combined together called as Dyavaprithvi. He is father of King indra the lord of rain. - Dyaus Vasu Homam is related to keeping one?s home reverberating with positive vibes all through the lifetime. Chandramas Vasu the Lord of Moon (Soma) and the controller of all forms of Emotions. Chandramas Vasu homam will work a wonder over your controlling power on emotions and rebuild you into a complete human?who is loved and liked by the whole world with the blessings of Chandra. The Nakstrani/ star in Hindu Astrology determine your character, the person you are, your personal pros and cons and traits. The way you shine in your life or degrade your health or ill health and your personal self is all dedicated to the traits of the star/nakshatra you are ruled by. Nakstrani Vasu Homam helps to improve the planetary positions in your birth chart and bless you with all the powerful and positive traits of the star that rules you and will change your life for the better and the best.